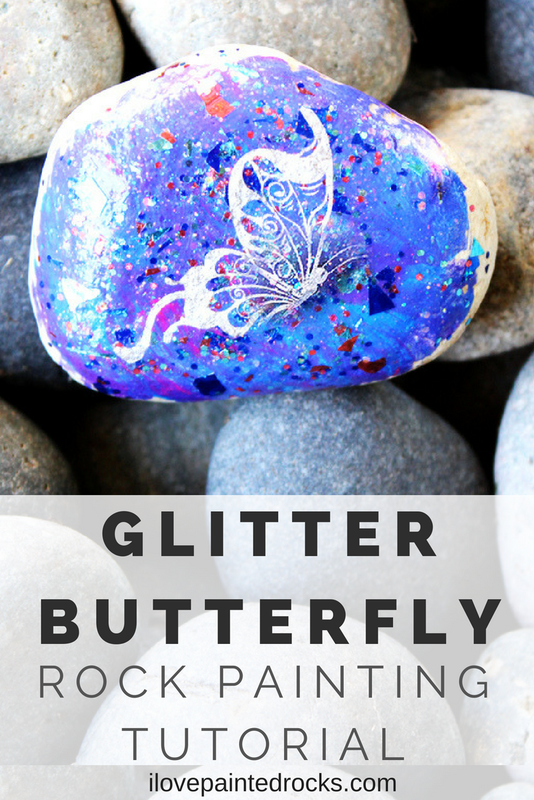 This painted rock tutorial features two of my favorite things: butterflies and glitter! My local rock painting group had a painted rock challenge this month where we were asked to paint and hide rocks with butterflies on them. Of all the butterfly rocks I painted, this one is by far my favorite! I used my new favorite glitter paint called Glitterific together with a technique I developed for applying temporary tattoos to painted rocks. 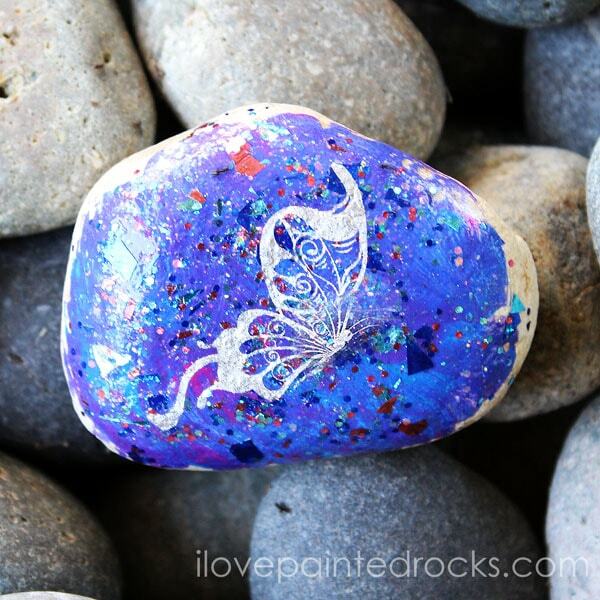 I ended up with a sparkly, galaxy style butterfly painted rock and you can make one, too! Are you adding glitter to rocks the right way? Check out the I Love Painted Rocks guide to responsible glitter use. Don't be the one putting the "litter" in glitter! 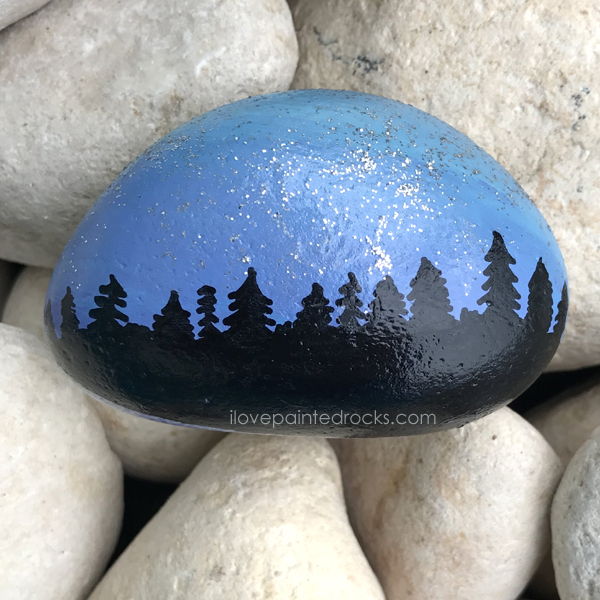 Use your favorite colors of acrylic paint to paint a flat rock in shades of blue and purple and allow to dry. Apply Glitterific paint over the top of the (now dry) painted rock. Allow rock to dry again. Choose the butterfly tattoo you like the most and cut it out. Peel the plastic film off the top of the tattoo. Place the tattoo face down onto the painted rock. Hold a damp sponge on the back of the tattoo for 30-60 seconds before carefully peeling away the backing. Smooth out tattoo as needed with sponge. Before applying spray sealer to your painted rock, seal the temporary tattoo with Mod Podge or Martha Stewart Decoupage Medium. Some metallic tattoos interact with the ingredients of the spray sealer, which can make the metallic finish run! So protect your rock by Mod Podging or decoupage sealing it first! Allow your painted rock to dry completely and then apply a generous coat of spray sealer. In order to be sure the glitter stays permanently adhered to the rock, I recommend three of more coats of spray sealer (allowing the rock to fully dry between coats). Get more information about the right (and wrong) ways to add glitter to painted rocks here.